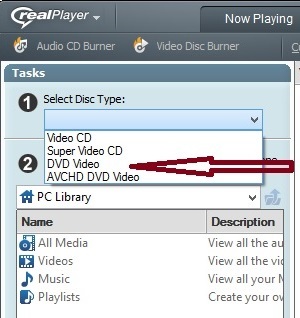 NOTE: Burning DVDs requires a RealPlayer Plus purchase or RealTimes subscription. A blank, single-layer DVD-R or DVD-RW disc. DVD-R is best for video. Do not use MiniDVDs (80mm). A DVD burner (a drive capable of writing to DVD discs). You must be signed in to RealPlayer Plus/RealTimes Premium or Unlimited. 4+ GB available disc space. Time. Burning a DVD can take 20 minutes or more depending on the speed of your burner. Put a blank disc in the DVD burner drive. Click Burn (located under Music in the left navigation pane). The Burn page opens. The first time you use the video burning feature, RealPlayer may prompt you to download additional software from RealNetworks. Click OK to accept the software, which must be installed before RealPlayer can access your video burning drive. RealPlayer may restart. Select DVD Video from the Select Disc Type drop-down list. Locate the video clips you want to burn onto the disc. Double-click a listed category, or select a category from the drop-down menu. To search for video clips elsewhere on your computer or network, select Browse... from the drop-down menu. Drag and drop the clips you select into the Video pane on the right, or select clips and click Add Selected to Disc. Click Burn Video to Disc. The "Video Burning Options" dialog opens. Enter a name or title for the disc. The default name is the first clip in your burn list. Select whether or not you want the disc to display on-screen menus. If yes, enter a menu header. (Default is the Menu Text for the first clip in your burn list.) 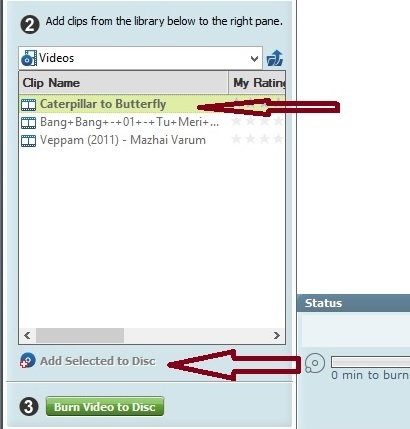 If you choose to not include a menu, playback will begin immediately with the first clip in the burn list and continue through each subsequent clip on the disc. Track the transfer progress of individual clips with the Transfer Status column in the burn list, and track the burn progress of the overall disc with the Time Elapsed/Time Remaining bar beneath the burn list. To cancel the progress and stop the burning, click Cancel Burning. Wait. Burning a DVD can take 20 minutes or more depending on the speed of your burner. RealPlayer alerts you when the burn is successfully completed. The clip order in the burn list will define their order in the disc's on-screen menu. If you choose to not include an onscreen navigation menu, the disc will play the clips in the burn list order automatically upon playback. Transfer Status shows you whether the clip is ready to burn. When you burn the disc, Transfer Status shows you the transfer progress of the individual clips (in %). Tracking your burn list/disc capacity: Near the bottom of the Burn pane, just above the Player Control bar, an info display tracks the file size and total duration of the clips in the burn list. If the amount of media in the burn list exceeds the capacity of the disc, RealPlayer will alert you. You may delete clips to fit the list to the disc, or else replace the disc with a higher capacity disc. Deleting a clip: To delete a clip from the list, right-click it and select Delete. If you opt for an on-screen menu in the "Video Burning Options" dialog, RealPlayer will create the menu's visual layout for you. The clips appear in the menu with the Menu Text applied to them. Each menu item is numbered in order: 1, 2, 3, etc. 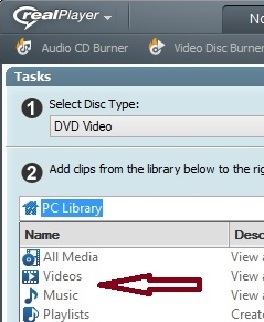 The disc title (from Video Burning Options) appears at the top of each menu page. If the disc holds 1 clip, it is centered on the screen. If the disc holds 3 clips, they appear in a triangle with one clip centered on top. If the disc holds 4 clips, they appear in a 2 x 2 grid listed in top-to-bottom, left-to-right order. If the disc holds 5 or more clips, they appear in a 2 x 4 grid in top-to-bottom, left-to-right order. For more than 8 clips, the menu is divided into 2 or more on-screen pages. You can click freely from one page to another to access their menu items. Video output standard: The technical playback standard encoded into the video for your compatible video player. NTSC (default) — NTSC is the video playback standard used in the United States, Canada, Japan, South Korea, the Philippines, Mexico, and other countries. Use this setting if your video player is NTSC compliant. PAL/SECAM — PAL and SECAM are video playback standards used throughout most European countries, most of South America, and other regions that are not NTSC compliant. Use this setting if your video player is PAL or SECAM compliant. Aspect Ratio: The width-to-height proportions of your video playback image. Normal (4:3) — Also referred to as 1.33:1 or "Academy" ratio, this is the familiar width-to-height ratio of standard TV screens and Hollywood cinema before widescreen movies and TV became commonplace. Video discs you burn with this setting will play back in this aspect ratio. Widescreen (16:9) — The common width-to-height ratio of widescreen TVs, widescreen computer monitors, and many motion pictures. Video discs you burn with this setting will play back in this aspect ratio. Burn Device: Select the local drive where your video burner is located. Write Speed: Select how fast you want the media to burn onto your disc. Check with your disc manufacturer for the optimum write speed appropriate for the disc. Click Save to preserve any changes and close the Advanced Options dialog. Or click Cancel to cancel any changes and close the Advanced Options dialog.